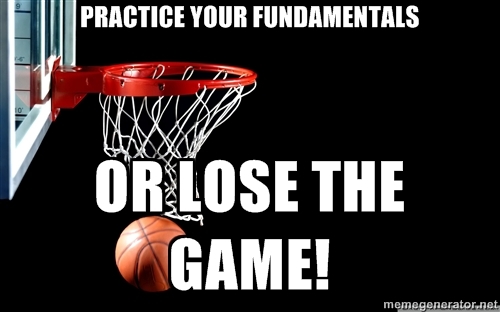 If you are a basketball player, you need to practice your fundamentals. Basketball players practice free throws and dribbling drills to improve instead of just playing basketball games. The same thing goes for musicians. Some musicians just practice major scales, and that’s the extent of their practicing the fundamentals. Others practice some minor scales in addition to their major scales. This isn’t really enough! I teach jazz at the middle school, high school, and college levels. I teach in the classroom and I also teach private jazz lessons. “72+72” is is one of the first lessons I go over with certain students. I don’t teach this practice routine with every student right off the bat, but I will sometimes teach it to a new student right away if the student already has some jazz experience. “72+72” is generally for students who already have some experience improvising. I’ll show this to a high school kid after they can already improvise, and it’s sometimes the first thing I will show to a college student if they played jazz in high school. I have never shown it to a middle school kid, but maybe someday I’ll have some younger student who are ready for it. “72+72” is a way of learning all of the major 7th, minor 7th, and dominant chords and learning to improvise over these changes. The First 72: Learn Your Chords! The first 72 represents the chords, the second 72 represents improvising a solo while playing the chords. I just listed 36 chords. If you double that number, you have 72. The first “72” is to learn two voicings for each of the 36 chords major, minor, and dominant chords. For a pianist, this means learning an “A” left-hand voicing and a “B” left-hand voicing. For guitar players, it means learning two moveable-shape voicings for each chord; one based on on the 5th string, and one based on the 6th string. The Second 72: Learn to Improvise Over Each Chord! Once the student learns all 72 voicings, they are ready for the next step, which is to play each chord and AND improvise using the associated major, dorian, or mixolydian scale. It is easy for pianists to play left-hand chords while playing a right-hand solo. A guitar player can play a chord and then immediately after improvise with the corresponding scale. Guitar players can also use a play along track, a buddy, or a loop pedal so they can continue to hear the chords as they improvise. There are 36 scales total (12 major, 12 dorian, and 12 mixolydian). The reason I call it “72+72” instead of “72+36” is that the pianist or guitarist uses each scale twice, once with each of the two piano or guitar voicings. A guitar player should learn to navigate the scales in two different positions, in a location on the neck close to each of the 2 voicings for each chord. The piano student should practice improvising in each scale with each corresponding “A” and “B” left-hand voicing. A guitar student should practice improvising in two positions, one based on the 5th string near the 5th string root chord, and a second position based on the 6th string root based on the 6th string chord. In summary, “72+72” for pianists and guitar players is 36 major, dominant, and minor chords with two voicings each (that’s the first “72,”) and then learning to improvise with each voicing (the second “72”). Bassists and horn players can use this exercise also, but they only need to play the arpeggio and then improvise with the associated scale. 36 arpeggios + 36 scales major, dominant, and minor scales for improvising. This is not an easy thing to practice, and it’s not right for every student right off the bat. However, I’ve found that it works WONDERS for some students who are ready to learn all of their chords and scales. Playing tunes becomes a WHOLE lot easier once you can play all over your chords and scales! “72+72” will pay huge dividends once you master all of your chords and scales, and it will make learning any tune easier! Hi Camden, I teaching my son music. Is there a recommend method or steps that you would use? Hey Winston! Camden no longer writes for us. But if you don't mind, I can offer a little bit of insight. Generally speaking, when I've started teaching someone music from scratch, I try to incorporate elements as you would learn a language. Incorporate learning some music by ear, easy songs he knows and enjoys. Have him start to read a little bit of music. You can get beginner books so he can get that side of things working. Also encourage him to create some of his own music, even early on. Doesn't mean he has to physically start notating it right away, but at least start fostering that creative spirit. Just my two cents, hope that helps! Questions regarding chords, assuming your spelling them out applies to keyboard. Are you focusing on putting the 3rds and 7ths in the bass? Is that assuming there's a bass player covering roots or is it a preferred sound in first and third inversion? At this stage, do you thin out to two and three note versions and if so, do you use 3-7 -or- 3-7-9?